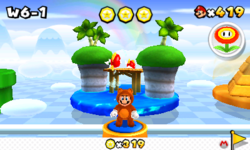 World 6 is the sixth world traveled to in Super Mario 3D Land. The setting of this world is a cloudy portion of the sky. There are many snowy mountains located in the background, as well as a rainbow. World 6 contains six levels and a Mystery Box. World 6-1 A level taking place on a seaside boardwalk with Cheep Cheeps leaping over it. World 6-2 A stage within a desert pyramid. World 6-3 The second ghost house in this game. The first area branches off into three areas, with only the left path leading to the end of the stage. World 6-4 A sky level which features trios of Beat Blocks that appear and sub-sequentially disappear to the music. World 6-5 An ice level with a lot of bounce pads. Requires 60 Star Medals to be unlocked. World 6- The fourth airship in the game. Skewers are a prominent threat. The boss is Pom Pom. This page was last edited on December 1, 2018, at 20:17.